What would it mean to abandon one’s tie to the Symbolic Order? 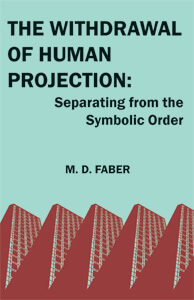 Following the path Freud laid down in Civilization and Its Discontents, M. D. Faber presents a profound analysis of the relationship between the individual and society. Faber contends that “ordinary consciousness” serves a defensive purpose: Even as we struggle to become separate individuals, we ceaselessly project the objects of our internal world into the environment. Our ordinary way of being is “transitional awareness,” a perceptual condition in which we strive to maintain our tie to the inner world by discovering substitute objects in the reality of our cultural realm. The symbolic sphere is a magic system of support whose purpose is to protect human beings against the danger of object loss. Exploring alternatives to ordinary consciousness, Faber turns to Buddhism, which provides practical techniques for moderating our tie to objects and liberating us from the symbolic order. In proposing emptiness of mind as the essence of mind, Buddhism offers an alternative to the Western attachment to (and glorifi cation of) the cultural sphere. Resting within the space of emptiness, one is freed from tormenting internal objects and the oppressive universe of symbols. Faber’s book presents a vision of culture as a vast transitional space. In our flight from separation and death, we project existence into symbolic objects, quelling anxiety and releasing ourselves from a sense of smallness and aloneness. As we feel enhanced by the objects with which we identify, we simultaneously are oppressed by them. Faber poses the question: What type of human being (and society) might emerge if people no longer clung so desperately to the symbolic order? M. D. Faber is professor emeritus of English Language and Literature, specializing in literature and psychology, at the University of Victoria, British Columbia, and the author of nine books, including The Magic of Prayer: An Introduction to the Psychology of Faith and The Psychological Roots of Religious Beliefs.